By Pat VerSteeg — This past Tuesday those attending the Kiwanis/ Senior Citizens luncheon were in for a treat. 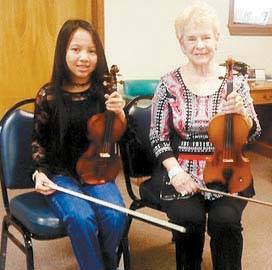 Talented violinists, Olivia Schmidt and Jeanie Henderson, performed to the delight of the crowd. On hand were Olivia’s parents Sandy and Greg Schmidt, and Grandmother Sue Suttle. Jeanie’s husband, Gary Henderson, was also in attendance as a guest.